He was born August 18, 1949 in Douglas Arizona. 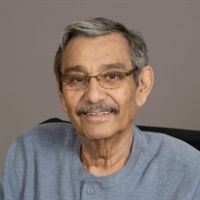 Hector entered the United States Army Reserves in 1968, and received an Honorable Discharge in 1972 when he moved to Tucson and entered the Construction Field. Hector was a Construction Superintendent for several large construction firms in the Tucson Area. Hector then went to work for the City of Tucson Planning and Zoning/Building Safety, where he retired. Hector is survived by his wife Ana, children Sylvia Bowles, Cynthia Inorio, and Hector Leyva, Siblings Luis, Alfonso, and Angie. Hector is also survived by his 8 grandchildren who were the light of his life.